Everolimus is an mTOR (the mammalian target of rapamycin) inhibitor, which is used for the treatment of advanced renal cell carcinoma. Life-threatening hemorrhages are extremely rare adverse effect of everolimus. 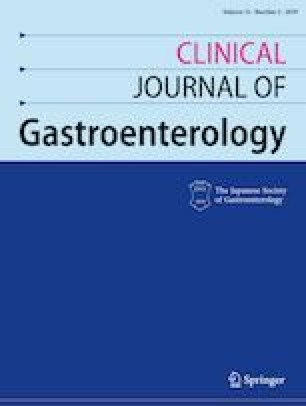 We herein report a successfully treated case of severe everolimus-related gastrointestinal hemorrhage by emergency surgical resection for patient with advanced renal cell carcinoma. A 72-year-old male was diagnosed with renal cell carcinoma, for which everolimus was administered after unsuccessful treatment with sunitinib and sorafenib. The patient suddenly developed hematemesis 4 weeks after administration. Upper gastrointestinal endoscopy showed gastric antral vascular ectasia. Once the hemorrhage was successfully cauterized by argon plasma coagulation, everolimus was discontinued. However, the patient after re-administration of everolimus developed hematemesis again and exhibited hemorrhage shock. Since therapeutic endoscopy could not achieve hemostasis, the patient underwent emergency distal gastrectomy with Billroth I reconstruction. The patient’s vital signs and hemoglobin level stabilized after the surgery. Thereafter, the patient made a satisfactory recovery, and was discharged on postoperative day 10. All procedures followed were in accordance with the ethical standards of the responsible committee on human experimentation (institutional and national) and with the Helsinki Declaration of 1975, as revised in 2008(5). The patient has given consent for the publication of images.